68 • June 2018 • S I G N & D I G I T A L G R A P H I C S ARCHITECTURAL AND ENVIRONMENTAL Volkswagen Dealership Jerame Jones, general manager of Leith Automotive, a Volkswagen deal- ership in Raleigh, North Carolina, was becoming increasingly discouraged by the look of his workplace. The dealership was as generic as they come. There was no energy, no culture, no sense of fun, and Jones could see that the lack of piz- zazz was having a negative effect on sales. 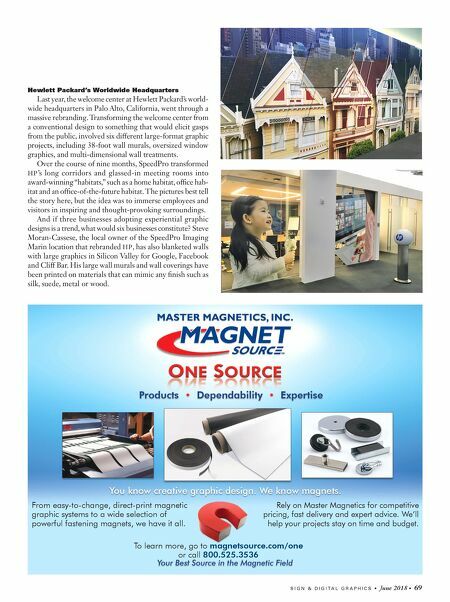 Jones turned to local SpeedPro Imaging owner Mark Simmons for a visual rebranding that would energize employees and customers. And, boy, would it. A Polynesian theme was introduced including window graphics that are 100 feet long and 20 feet wide. 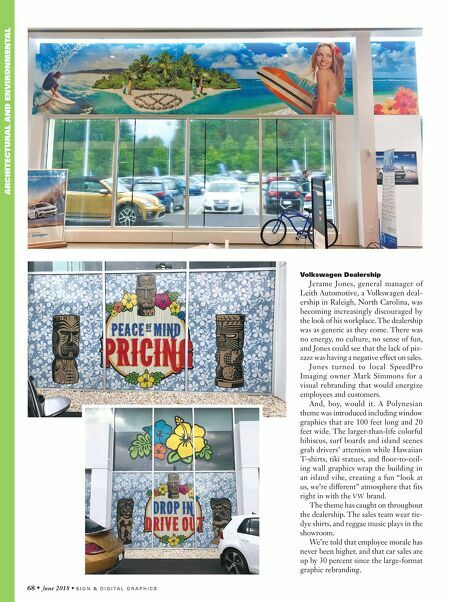 The larger-than-life colorful hibiscus, surf boards and island scenes grab drivers' attention while Hawaiian T-shirts, tiki statues, and floor-to-ceil- ing wall graphics wrap the building in an island vibe, creating a fun "look at us, we're different" atmosphere that fits right in with the VW brand. The theme has caught on throughout the dealership. The sales team wear tie- dye shirts, and reggae music plays in the showroom. We're told that employee morale has never been higher, and that car sales are up by 30 percent since the large-format graphic rebranding.